This lovely lady is going to brighten your day. She is 19 inches tall, and is able to sit, bend her knees, and has articulated fingers. 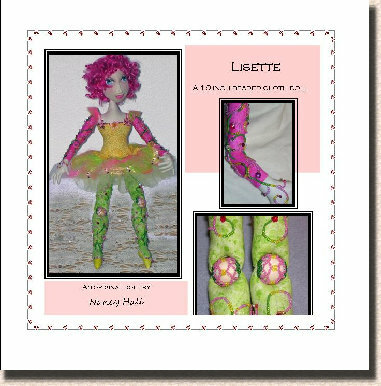 Use your brightest scraps for her legs,arms and bodice. Only the hands, face and chest are in muslin or knit flesh tone fabric. 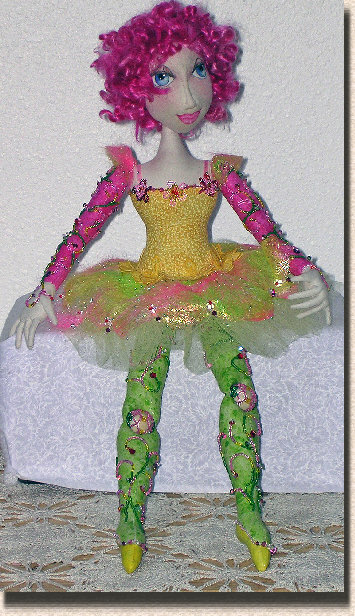 The clothing for the doll is a tutu of angelina fiber and net, though you could use anything you want. Feel free to completely bead the bodice and embellish to your hearts content! The pattern is on a CD and is in PDF format and Word. The pattern is available as an E-Pattern in PDF Format only through ETSY. It will be emailed to you as soon as payment is received. painting instructions for the face.